The Besson Prestige Euphonium is the culmination of years of experience and listening to the best players in the world. It truly is the ultimate euphonium in the brass world today, combining a strikingly beautiful appearance with new state-of-the-art features which has meant the best has just got better. 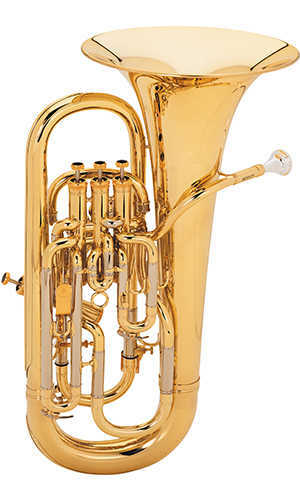 This new model will ensure the Prestige euphonium its place in history as the world leader in euphonium design. New valve technology means you'll not experience better than the Prestige; superbly smooth and rapid action. The eye-catching gold plating features make these instruments a sumptuous visual treat. Players will adore the sound, the control over all aspects of tuning (with the famous trigger feature as standard) and the playing comfort that the Prestige offers. The meticulous attention to detail and craftsmanship with the new instruments is admired by players everywhere. Special design features : The famous tuning slide trigger with new protective shield and new snap-on ball quick release system; Longer tuning slide for increased flexibility of pitch range and trigger use; Classic leadpipe with single fixing stud and stay for the classic sound and resonance. Special design features : Attractive gold plated trigger, valve button tops, bottoms and valve caps; New, slightly heavier mouthpipe receiver; New shaped false piece for right hand; New modern design valve screw top stops; Valve screw tops inlaid with black felt. Special design features : New black onyx inlaid button tops; Original Besson euphonium valve springs; Slightly heavier valve screw bottoms; Increased durability/protection on back branch; New luxury case design and accessory kit; water reservoir located under the valves to protect your clothes. Playing characteristics : A full, rich tone throughout its huge range; Sail up to the highest notes with ease; The famous colour of the Besson tone with increased ease of operation.